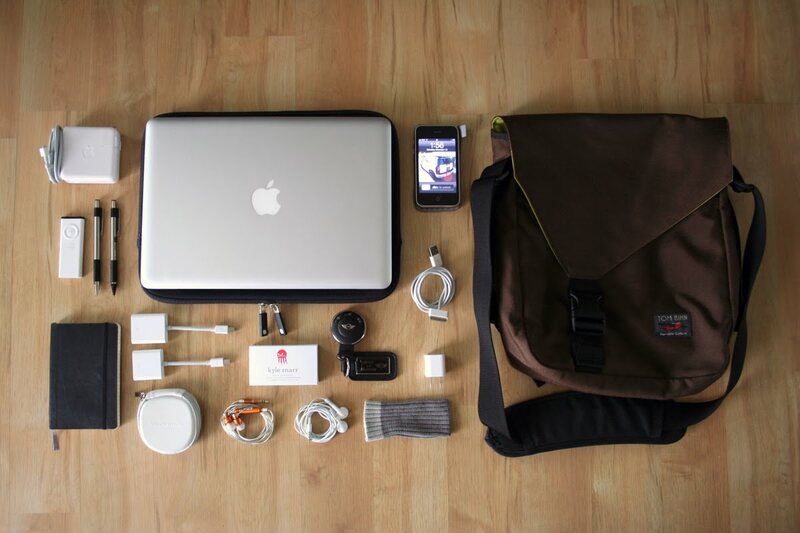 Kyality: a blog about music, movies, tv, cars and design: What's in your bag? So I recently ordered a Large Cafe Bag in Cocoa/Wasabi from the Seattle-based company Tom Bihn and I absolutely love it! I've searched far and wide for a simple, clean-lined messenger bag (in brown) that fits my on-the-go job requirements. I'm constantly doing day trips from SLC to places like LA, SF and PDX. The streamlined nature of your Cafe Bag is perfect. It fits everything I need to cruise through airport security, do a couple of client presentations and carry the little extras that make flying more enjoyable. I snapped this pic and it was recently featured on the Tom Bihn blog. I love the business card with the Google Search bar the most. That is so smart, and it will be even more perfect and will take you directly to his website. Is it a 13" Macbook?